Teach To Stamp: Goody Gear! The Goody Gear Simply Created Kits come in two different colours, Real Red, which I used for a Christmas treat and Pumpkin Pie, which I used for Thanksgiving and Halloween. 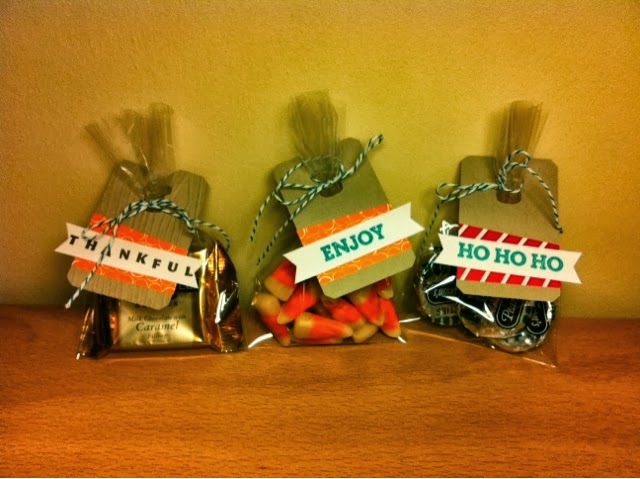 The kits are only $6.95 each and come with enough supplies to make 10 treat bags. The enjoy and Ho Ho Ho come from the coordinating stamp set, Oh, Goodie! The only extra supplies you need are ink and little adhesive and you're good to go! Or better yet, get some friends together and host a private class, then you get to make your treats together and you earn free Stampin' Up! product as the hostess, double treats for you! Who do you know that could use a treat?